The new MuscleBlaze® Super Gainer XXL is a high-calorie formula for elite bodybuilders to elevate mass gain. 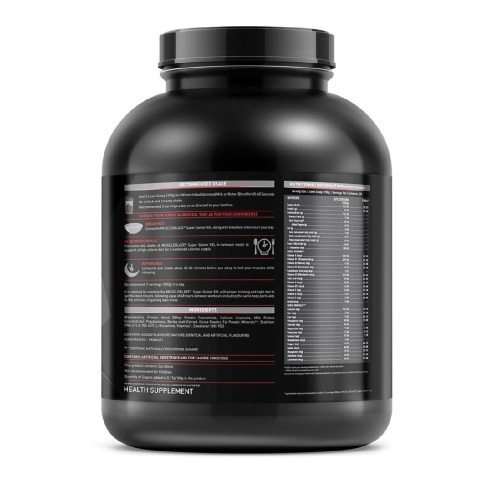 This gainer formula provides a whopping 22.50g of protein per serving along with 112.5g of complex carbohydrates which fuel your muscles with sustained release of calories. The new MuscleBlaze® Super Gainer XXL contains a high-quality blend of proteins and each serving provides 22.5g of these proteins for synthesis and recovery of muscle tissues. These proteins release amino acids in the bloodstream which transport the nutrients to the damaged muscle tissues. Complex carbohydrates are required when we need to gain mass as these carbohydrates are absorbed and digested slowly to provide a sustained release of energy for up to long hours. The supplement has a protein to carbohydrates ratio of 1:5 and each serving delivers 112.5g of complex carbohydrates which are released slowly and gradually. 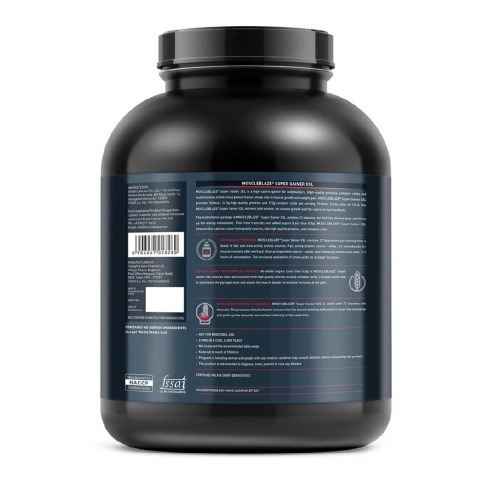 Enriched with 27 essential vitamins and minerals, this Super Gainer XXL ensures a strong immunity and replenished the nutrients lost during intense workouts. Unlike other gainers available in the market, MuscleBlaze® Super Gainer XXL does not contain any added sugar and hence prevents any unwanted and useless substance from going into your body. Add two level scoops (150g) of MuscleBlaze® Super Gainer XXL to 300-350ml water or milk. Blend in a blender for 35-40 seconds to get a rich and creamy shake. Breakfast: Consume MuscleBlaze® Super Gainer XXL along with breakfast to kickstart your day. In-between meals: Consume one shake in-between meals to support a high-calorie diet for a sustained calorie supply. Before bed: Consume one shake about 45-60 minutes before you sleep to fuel your muscles while sleeping. Note: Do Not Exceed 2 servings (300g) in a day. 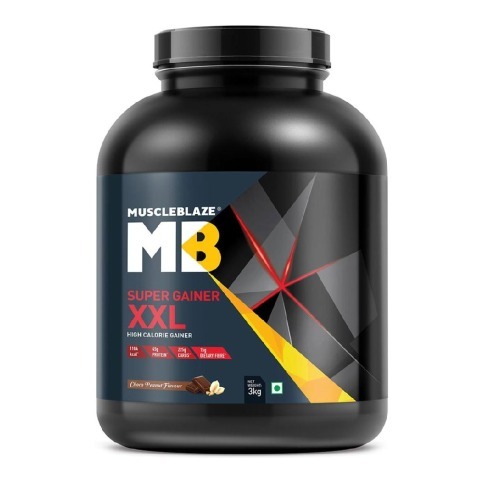 What is MuscleBlaze Super Gainer XXL? 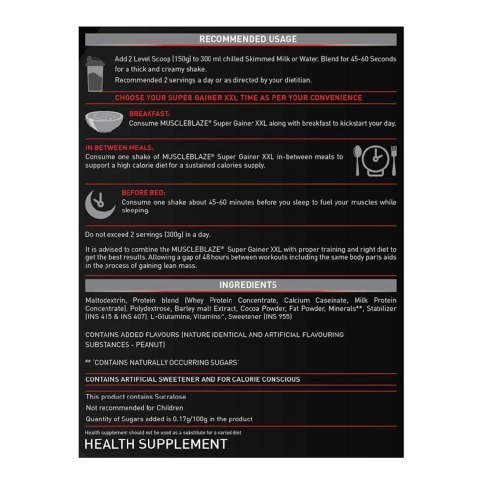 What benefits MuscleBlaze Super Gainer XXL offers to the bodybuilders? MuscleBlaze Super Gainer XXL offers high-quality proteins and complex carbohydrates in the ratio of 1:5 to the bodybuilders, which gives them energy for intense training sessions. 27 vitamins and minerals build energy and immunity in the muscle builder. Additional energy helps them sustain longer workouts. 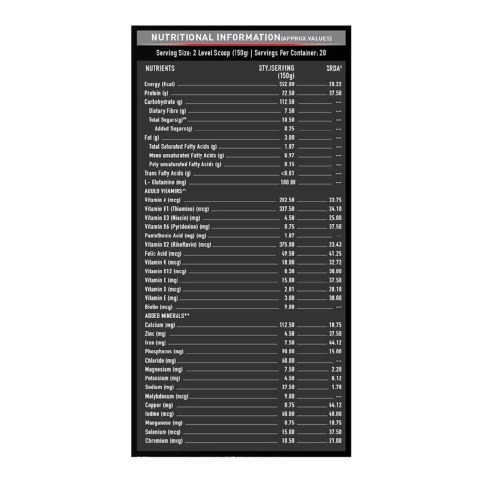 MuscleBlaze Super Gainer XXL has no-added sugar and zero trans fats. Why should I take MuscleBlaze Super Gainer XXL? You should take MuscleBlaze Super Gainer XXL to fill in the high-calorie and nutrient needs required to build muscle mass and strength. MuscleBlaze Super Gainer XXL will give you the energy needed to work out intensely and provide you enough nutrients to build unadulterated muscle mass in a ready-drink shake mix. 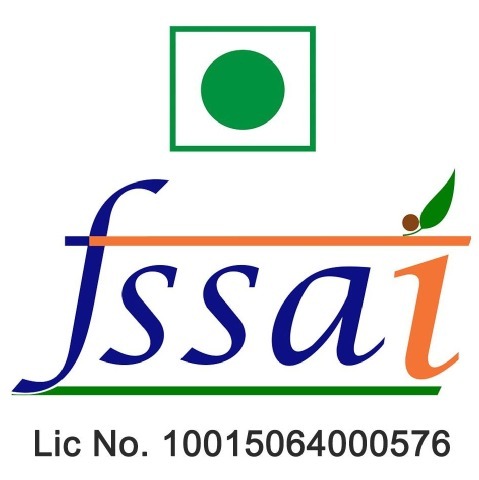 Therefore, it becomes easier for you fulfill your increased calorie and nutritional requirements.